Whippet Beagle Mix – Beautiful Blend Or Crazy Combination? You are here: Home / Breeds / Mix / Whippet Beagle Mix – Beautiful Blend Or Crazy Combination? The Whippet Beagle mix dog is a newer type of crossbreed or “hybrid” dog breed. The Whippet cross Beagle has two awesome parent dog breeds. While there is some controversy surrounding the issue of so-called “designer” or hybrid dog breeds, there are some very positive attributes to this movement. Designer “Hybrid” Dogs – What Does Science Tell Us? Not everyone is a fan of “hybrid” or designer dogs. For breeders in particular, hybrid dogs are not considered to be true dog breeds. Rather, a hybrid dog results when two parent dogs from different purebred lineages are bred together to produce puppies. Depending on who you ask, these mixed parentage puppies are either designer dogs or garden variety mutts. It is understandable that dedicated purebred dog breeders may not be so keen about seeing their carefully cultivated purebred bloodlines casually diluted to produce hybrid puppies. However, canine genetics tells us this might just be the best thing that has ever happened to certain at-risk purebred dog lines! This theory is called “hybrid vigor” and it refers to how a purebred dog’s gene pool can potentially be diversified and strengthened by “outcrossing” it (mixing it) with another dog’s genetic line. In fact, this is precisely the type of activity that may just save seriously inbred purebred dog breeds, like the wildly popular French Bulldog. This breed now has so many known health issues as a result of selective breeding for appearance that this dog’s own gene pool likely won’t be able correct these problems from within without the help of outcrossing. It is also worth mentioning that The Institute of Canine Biology supports outcrossing as a viable method for strengthening weak purebred dog genetic lines. Interestingly, The Institute also cites hard data showing that mutts are frequently healthier and stronger in a subset of ten specific genetic disorders over their purebred peers. Part of the process to fully appreciate the unique qualities of the Whippet Beagle mix comes in studying this hybrid dog’s lineage. Of course, a Beagle cross Whippet has two different purebred dog parents: the Whippet and the Beagle. Let’s take a closer look at the origins of each parent dog. If you have ever seen a dog that looks like a mini-Greyhound and thought, “I didn’t realize Greyhounds came in that size,” it was probably a Whippet you were looking at. In fact, the Whippet was first bred in England to be a smaller version of the Greyhound, and so the two dog breeds do share some genetic similarities. The Whippet has sometimes been nicknamed the “poor man’s Greyhound,” but these dogs are anything but second rate. The Whippet today is a first-class small sighthound that is all business when business is called for (easily reaching speeds up to 35 mph!) and equally happy to rest quietly at your side in between runs. The Beagle is currently the fifth most popular dog breed out of the 194 breeds registered through the American Kennel Club. This cheerful, friendly howling hound has long been a favorite companion for hunters and families alike. The Beagle’s precise lineage is not clear, but it is thought these dogs are indigenous to England. The Beagle is a very social dog and loves the company of people and other dogs, making this dog breed a wonderful addition to family life. Is The Whippet Beagle Mix A Hypoallergenic Dog? There is no doubt the dog-loving world got wildly excited at the first news that it might be possible to own a hypoallergenic pet dog. Today, science tells us that the whole concept of a hypoallergenic pet is essentially a myth – impossible. The confusion arises because people don’t understand what is causing their pet allergies. Many people think they get allergy symptoms when their dog sheds. But really, the allergy symptoms arise when you come into contact with a protein called can f 1. How Does Can f 1 Affect My Allergies? Can f 1 is secreted through a dog’s saliva, skin, and urine. When your dog licks himself, the protein is transferred to the hair. That hair sheds out and you go to clean it up. You get the protein on your skin and, because it is airborne as well, you breathe it in. Then your allergies flare up! It is true that a dog that sheds less may trigger fewer allergy symptoms, but this is because you won’t have as much cleaning to do. The Whippet sheds very little, and the Beagle sheds moderately. If you have pet allergies, you will fare better if your Whippet cross Beagle puppy takes more after her Whippet parent! The Whippet can weigh anywhere from 25 to 40 pounds and stand anywhere from 18 to 22 inches (paw to shoulder) as an adult. Adult male Whippets tend to be taller and heavier than females by a few inches and pounds. The Beagle is bred in two sizes. The smaller size Beagle will stand under 13 inches high (paw to shoulder) and weigh less than 20 pounds. The larger size Beagle will stand 13 to 15 inches (paw to shoulder) and weigh 20 to 30 pounds. The adult size and weight of your Beagle cross Whippet will depend somewhat on the size of the Beagle parent dog. This will vary more in first-generation Whippet Beagle mix puppies than in later litters. The Whippet dog’s personality and temperament may take more after their calm, graceful Whippet parent or their rambunctious, merry Beagle parent. There is really no precise way to know in advance what any given puppy in a litter may be like! This is part of the inherent unknown factor when bringing home a hybrid puppy. 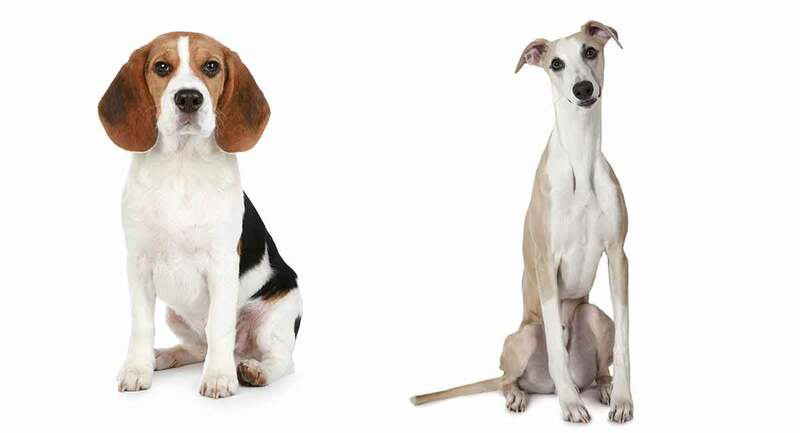 Luckily, both the Whippet and the Beagle are known to be smart, playful, affectionate, attached to “their” people, sociable, energetic and loving. This bodes well for any Whippet Beagle mix puppy you may bring into your life! You might feel like every aspect of the Whippet Beagle mix dog checks out for being a good fit for your life. But no study is complete without taking a look at health. Gene inheritance is inherently unpredictable in any hybrid mix, especially in first generation puppies. This means there isn’t any sure way to know which purebred parent your new puppy may most take after. That includes appearance, temperament, personality, size, weight and health. Learn as much as you can about the known health issues of each purebred parent. Then you can determine if the right tests have been done before breeding the parent dogs. In cases where there is no available pre-screening test to rule out a known genetic issue, you just need to be as informed as possible before you make that lifelong commitment to a new Whippet Beagle puppy. 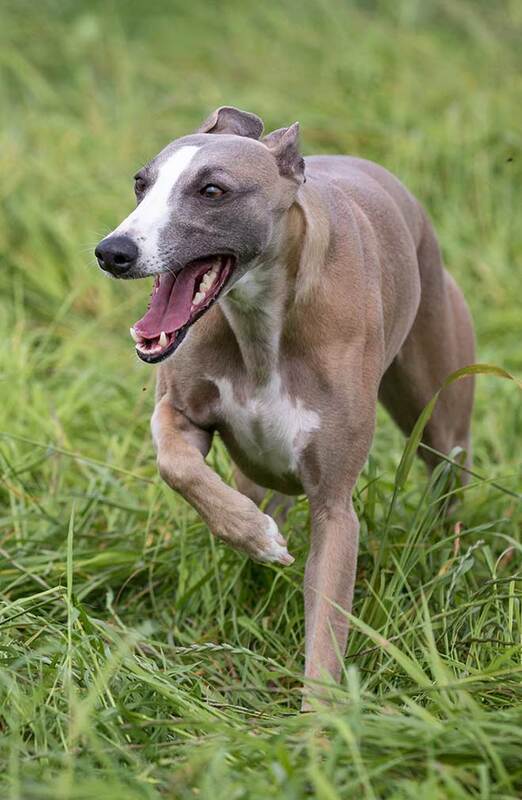 Perhaps the best-known (or at least the most widely publicized) known genetic health concern in Whippets is a DNA mutation in a gene called myostatin. This mutation creates an extra-enhanced set of muscles. This happens because the myostatin gene is not doing its job to produce muscle inhibitors (you can see a picture and read more about this condition in this article). Currently the Club recommends that all Whippet breeders test their parent dogs for vision, hearing, and heart function. 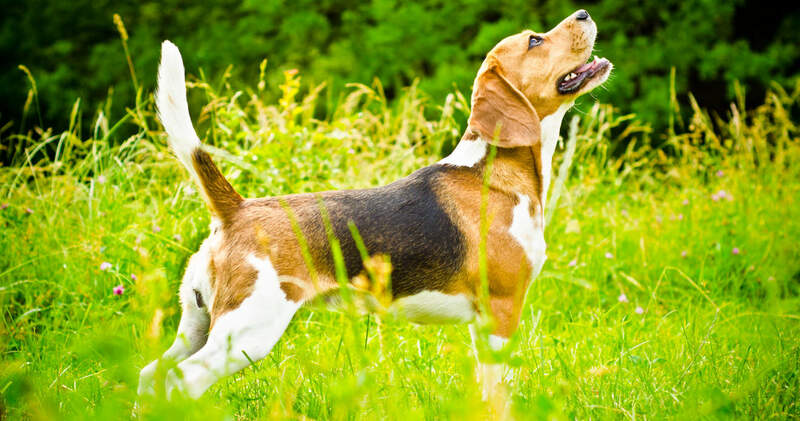 Beagle dogs are generally healthy and hardy dogs, but they can suffer from certain heritable health conditions. Two of the most problematic, on a practical level, are hip dysplasia and luxating patella (dislocated kneecap). Both require surgery to correct. The most concerning genetic condition is called Musladin-Lueke Syndrome (MLS). This disease causes abnormal physical development as well as other health issues, and there is a test for it. Another genetic condition Beagles can inherit is Neonatal Cerebellar Cortical Degeneration (NCCD). This condition affects hind leg coordination, and there is a test for it, also. Three other heritable conditions of concern include Factor VII Deficiency, Steroid Responsive Meningitis (SRM) and Imerslund-Grasbeck Syndrome. All three can affect several dog breeds and are still not fully understood. Other known health conditions Beagles can develop include hypothyroidism, epilepsy, and eye issues. There are a number of potential heritable health conditions that may affect Whippet Beagle mix puppies. The good news here is that when you work with a reputable breeder who places the health of the breeding parent dogs and puppies first, you are highly likely to bring home a puppy that carries the lowest possible risk of developing heritable health conditions for which there are pre-screening tests. The Whippet’s average lifespan is anywhere from 12 to 15 years. The Beagle’s average lifespan is anywhere from 10 to 15 years. This means your Whippet Beagle mix may live anywhere from 10 to 15 years. Of course, diet, enrichment, exercise, lifestyle, and access to preventative veterinary care can also influence overall expected lifespan. Whippet and Beagle mix breeders have two ways to breed this mix. One is from two purebred parents (the Whippet and the Beagle). These puppies will be called f1 puppies. Or they may be breeding from two Whippet Beagle mix dogs. In which case, the puppies will be called f1b puppies. Not surprisingly, it can be easier to control and predict the appearance, size, weight, temperament, personality, and health of f1b puppies. If you are seeking a very specific set of traits in your Whippet Beagle mix dog, you may want to seek out a breeder who specializes in f1b puppies. All reputable breeders should willingly provide (volunteer) proof of parent dog genetic health testing and all required vaccines and deworming. The breeder should also offer an initial guarantee of puppy health and a take-back offer if the new puppy does not work out for any reason. Beagle Whippet puppies are really, really cute. Once you see them, it will be very hard to resist bringing one home! So what should you look for when you do get to the point where you are selecting your Whippet Beagle mix puppy out of the litter? Look for a puppy that is bright-eyed, clear-eared, and clear-nosed with a healthy coat and plenty of energy. The puppy should be comfortable being held. She should also exhibit curiosity and willingness to interact and play with you and her littermates. These are indications that early socialization has been successful. Is A Whippet Beagle Mix The Right Pet Dog For Me? There truly is no “best” answer to the question of whether a Whippet Beagle mix dog is the right canine sidekick for you. There is only the answer that best fits you! Now that you know more about the Whippet Beagle mix dog, what do you think? Could this be your next pet dog? Please drop us a comment to share your thoughts! Regalado, A., “First Gene-Edited Dogs Reported in China,” MIT Technology Review, 2015. AKC, “Whippet,” American Kennel Club, 2018. AKC, “Beagle,” American Kennel Club, 2018. Lee, K., “Whippet Health,” American Whippet Club, 2018. Hall, D., et al, “Beagle Health,” The Beagle Association UK, 2018. Lockey, R., “The myth of hypoallergenic dogs (and cats),” Journal of Allergy and Clinical Immunology, 2012. Our whippet-beagle mix, Dexter, is seven years old. I’ve told people he’s a “whiggle” before seeing any publications related to this mix. We adopted Dex from a shelter when he was just 4 months. I don’t think his breeding was intentional. He was quite a challenge when he was young, but with lots of patience and hard work he has become an absolute pleasure. We’ve got a Whippet Beagle mix absolutely adore her. She is completely healthy, strong as an ox and fast. I describe her mix as a dog that runs 30 mph with her nose to the ground. She does get impacted by runs through brush with a slight skin rash from time to time. Our vet provided guidance and easily manageable. Dixie is now 8 years old. I’m 65, retired. teacher as well retired Marine. As a child our family had a beautiful loving Whippet. Our sweet girl was probably the most perfect companion ever created; with our adopted Shepard being equally loving and loyal. we were graced by both gifts from God for 16 years. I would enjoy having a Whippet again.